Extreame Savings Item! Save 49% on the Calily Tailbone Coccyx Cushion Orthopedic Seat Cushion for Office Chair, Car, Trucks, Airplane, etc. – Amazing Relief for Lower Back Pain, Tailbone, Sciatica, Pelvic Pain, Prostate, etc. [UPGRADED] by .Calily at Momiji Studios. Hurry! Limited time offer. Offer valid only while supplies last. The Calily Premium Orthopedic Seat Cushion eliminates sitting pain for those suffering from medical issues that make life unbearable when sitting. The Calily Premium Orthopedic Seat Cushion eliminates sitting pain for those suffering from medical issues that make life unbearable when sitting. The Calily Premium Orthopedic Seat Cushion is designed to help individuals have a more normal life by reducing pressure on those sensitive areas when sitting. The Calily Orthopedic Seat Cushion provides pain relief by taking pressure off your back, hip, legs, tailbone, sciatica, prostate, perineal, pelvic area, etc., and allows for hours of sitting without experiencing any pain, aches, fatigue or soreness. The seat cushion's design gives the impression of being almost like an ordinary seat cushion, thus enabling users to sit comfortably while keeping their medical condition private. The seat cushion can be used for home chairs, office chairs, airplane seats, car seats, bleachers at the ball game, lounge chairs on the patio, wheel chairs, and many other places. BACK PAIN & ACHE RELIEF - The Calily Tailbone Coccyx Cushion allows for hours of sitting without experiencing any pain, aches, fatigue or soreness. Alleviates lower back pain and pelvic area aches and soreness. 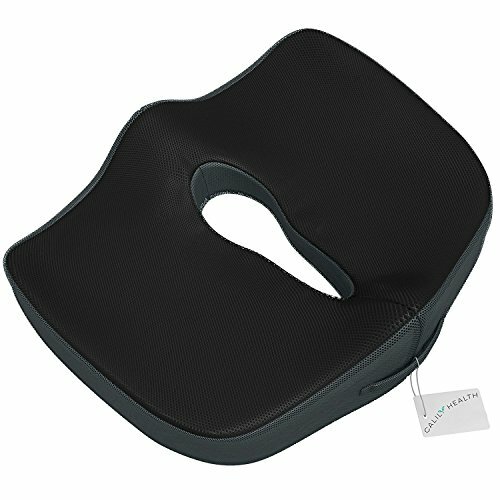 The Calily Orthopedic Seat Cushion provides pain relief by taking pressure off your back, hip, legs, tailbone, sciatica, prostate, perineal, pelvic area, etc. COMFORTABLE & BREATHABLE - Made with soft and breathable fabric to help stay cool and comfortable for many hours of sitting, and features a non-slip bottom to keep cushion in place. Zippered cover is washable to ensure sanitary and long term enjoyability. CUT-AWAY CENTER AREA - Features a cut-away space at the center for conditions that require zero contact at the genital area. The Coccyx Cushion Orthopedic Tailbone Seat Cushion provides relief for hemorrhoids, prostatitis, post-delivery recovery for mothers and other perineal and pelvic floor disorders. Much more effective and comfortable than donut pillows. HEALTHY & STRAIGHT POSTURE - Features an elevated back section to promote a healthy sitting posture and allows the tailbone and spine to be balanced for weight distribution. QUALITY- Guaranteed to stay firm and provide years of excellent results. Lightweight and easy to take along during travel. / Upgraded with premium inserts for enhanced support. View More In Back & Seat Cushions. If you have any questions about this product by .Calily, contact us by completing and submitting the form below. If you are looking for a specif part number, please include it with your message.